Owner: Alpe del Nevegal s.r.l. Thanks to GPSVisualizer.com for providing KML rendering! 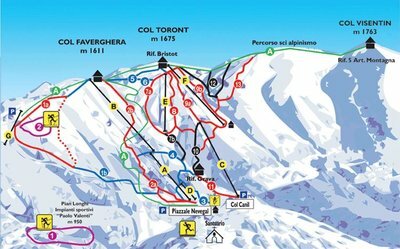 Skimap.org by https://skimap.org/ is licensed under a Creative Commons Attribution-Noncommercial-Share Alike 3.0 United States License. Based on a work at www.skimap.org. Permissions beyond the scope of this license may be available at https://skimap.org/pages/licensing. Template modified from original by nodethirtythree under Creative Commons license. Country icons by kampongboy92 are under a Creative Commons license.